Happy Birthday and a Giveaway! Secondly, when asked if writing and illustrating was easier for her now that she has more than 40 published books, Jan responded, “No!” She explained that it generally takes a year to complete a book and as her deadline draws nears “It’s madness. I go into lockdown. It gets very intense.” When asked if there is jubilation when she completes a book, Jan surprised us all by revealing that she usually believes, “This is the worst book I’ve ever done.” Then after a year or two she decides she likes the book, but fears “I’ll never be able to do a book like that again.” Silly, silly Jan. 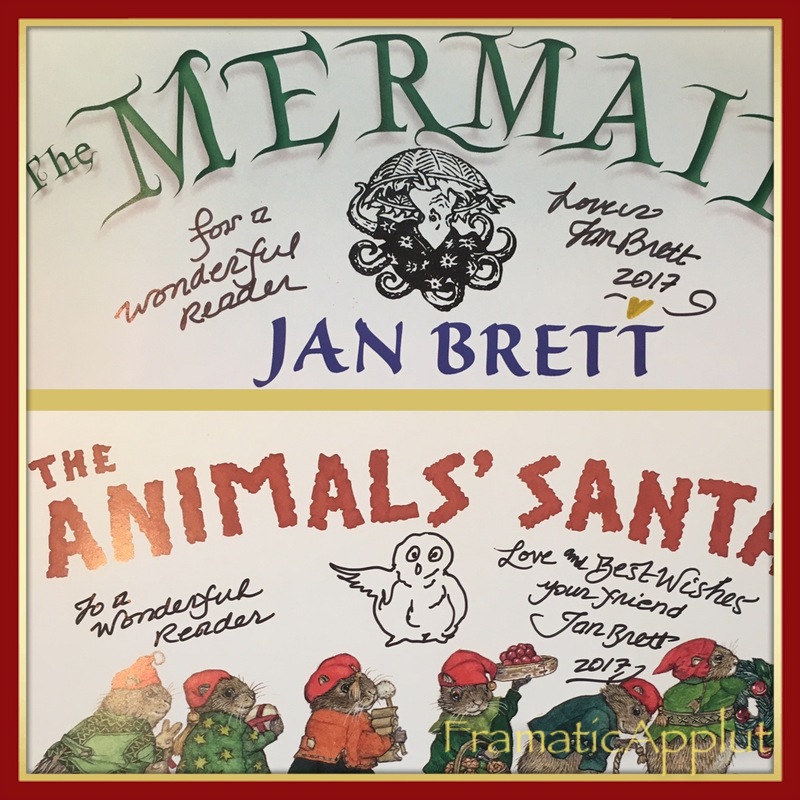 In celebration of Jan Brett’s birthday and her amazing books, this month’s First Friday Giveaway will have two winners. before midnight, December 10, 2017. Happy birthday, Jan! I sure hope you’re working on a new book! PS: Just heard about a neat opportunity. It’s called the Follett Challenge, and schools can win a whole bunch of stuff. Get the scoop HERE. Congratulations to Linda and Julie, the winners of this month’s First Friday Giveaway! Happy Birthday, Jan, and thank you for all of the beautiful books you have written. Happy Birthday, Jan. My students love your books, they get so much out of them- the students have vocabulary and phonics lessons with your books. My students are the struggling and ELL students. Thank you for writing such a wide variety of books. Happy Birthday, Jan! Thank you for all the wonderful books you’ve put into the world! Happy Birthday, Jan! My birthday is this month too. Celebrate each and every day! Happy Birthday, Jan. Have a great day! Wishing you a wonderful birthday Jan. Thank you for sharing your talent with us. We love your books. Happy, Happy Birthday Jan Brett. I saw you last year in Seward, NE and you were AMAZING! Wish you were close enough this year to see you again! Happy Birthday, Jan! I absolutely LOVE your books. My kids are always so engaged in the books when I read them. I can’t wait to read the new book. Happy Birthday Jan!! I love your books. Happy Birthday! All of our students and teachers love you books! Happy Birthday to YOU Jan Brett! My students and I LOVE ALL of your books! Happy Birthday, Jan! I love to use your books in my K-1 Library classes. We look for clues in the illustrations that are not in the text! Happy Birthday Jan! My children and I enjoy your books. Happy Birthday, Jan! We enjoy your books! Hauoli La Hanau from Hawaii, jan Brett! Wishing you (and the mermaid bus) could visit Hawaii. There are 50 (soon 51!) public libraries and more than 200 schools in the only statewide Department of Education in the nation! Think of all the parents, teachers and librarians who grew up with your books and are sharing their love of Hedgie, Berlioz, and Daisy with their keiki (children). Mahalo for sharing your stories and art with us. Happy Birthday, Jan, may you have many, many, many more birthdays to celebrate with all your loved ones. Enjoy your day, and looking forward to your next book! Happy birthday to an amazing writer! I love your books! Happy Birthday,Jan. Along with my students,I too enjoy reading your books over and over again. May your special day be full of blessings,love, fun and peace. Looks like you had a happy and eventful birthday! A very Happy Birthday! ???? Happiest of birthdays to my favorite author of all. 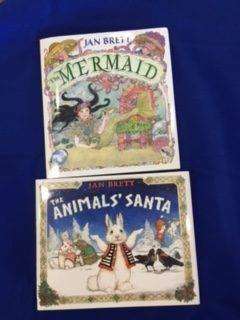 It is such a joy to share the wonderful world of Jan Brett through your books and web resources with my first and second graders. Thank you for sharing your gifts with so many. May you be blessed with many more wonderful years. Happy birthday to one of the best children’s book authors ever! Happy Birthday, Jan. We’ve loved your books for a long time. Our first favorite was The Mitten. It’s been love since! Met you years ago in Clinton NJ, just love your books and illustrations. Happy birthday Jan! Your books delight all ages! Hope your day is special! Happy birthday to you! Looking forward to your next book! Happy, Happy Birthday! ??? ?I absolutely love your ???? books. Looking forward to reading many more of your books in the future. Thanks!! Your books are so amazing! Happy Birthday, Jan. I love your books and can’t wait to see what’s next. Happy Birthday, Jan! Your books are amazing! Happy Birthday Jan! Every year I look forward to incorporating as many of your books as I can into our Second Grade Reading and Writing lesson plans. The students are so motivated by the stories and all of my budding artists LOVE seeing the illustrations. I have to say, a favorite character of theirs is the Tomten from Hedgie’s Surprise …. they just think he is hilarious! Thanks so much for all of the great children’s books you’ve written and illustrated. Wishing you the happiest of birthdays, Jan!! This looks like another amazing book! Here’s wishing you a Mer-tastic Birthday ???????????????????? Thank you for the years of smiles, delight and joy you have brought to my classroom. Happy Birthday! Happy Birthday, hope it was a good one! Happy Birthday Jan! Thank you for sharing your stories with us. I can’t wait to share your books with my first graders. Happy Happy Birthday! Enjoy your day!! Have enjoyed reading your books!! Thank you! Happy birthday, Jan! Love your books! Happy Birthday! I have your books in my preschool classrooms for many years now! Keep sharing your gift and inspiring the imaginations of children and teachers everywhere! Hope you have a happy birthday Jan! Happy birthday Jan. Thank you for many happy memories with your books. Happy, happy birthday Jan! I hope you day was extraordinary! Happy birthday Jan! My kids (both school and home) love your books! Happy birthday! Second times the charm! Happy Birthday Jan! Thank you for all of your amazing books. My kids and students love each of them! Happy Birthday, Jan!! You are one of my most favorite children’s author/illustrators. I read your books to my 2nd graders and use at as an example of an author who uses colorful words when teaching them about revising their own writing! Thank you! Happy birthday, Jan! My first graders and I love your books! Happy Birthday! The teachers & students of J.R. Brooker Elementary love your books! Thank you! Happy birthday! My class and I did an author study this week—we love the hedgehogs! Happy birthday Jan!! My family and I have enjoyed all of your books!! Happy Birthday Jan Brett! All of your books are amazing, my class and myself love reading them. We like trying to find the hidden hedgi as well. Happy Birthday to an amazing author! Hope you have a great day! Happy Birthday Jan! Sorry I missed you at the Unlikely Story Bookstore in MA last week! Happy Birthday Jan!! Hope it is full of whimsy and fun!! Happy Birthday, Jan! I’ve loved sharing your books with my students and my own children for years! Wishing Jan the very happiest of birthdays!! Thank you for your amazing work! Happy birthday Jan! I am a December birthday as well! Not only do my students love your books, I do too! Thank you for sharing your talent with all of us! Happy birthday, Jan! Love your books!! Happy Birthday . Have a wonderful day. Happy birthday! I’m excited for your new book. Happy birthday, Jan! I love reading Armadillo Rodeo to my class every year! Happy birthday, Jan! May God bless you with lots of fun and giggles this next year. God made you special and He loves you very much. Happy Birthday, looking forward to your new book! We have an adopted son who has a December birthday, too! that have touched the lives of countless children! I hope God blesses your special day! My niece is obsessed with Mermaids so this would make the perfect Christmas present for her! Happy Birthday! Happy Birthday! My class is studying you as our author of the month for December. They are so excited to read your books! Happy birthday! We are in awe of your gorgeous books! Happy Birthday, Jan! I have enjoyed your books as a teacher and as a parent! Happy Birthday Jan Brett!! ??????????????? ?My class will study your books and illustrations in the new year!! You are our Author Study for the month of January!!???? We would love to expand our collection! Have a beautiful birthday!!! Happy birthday!!! Happy Birthday, Jan! Wishing you a joy-filled year! What a beautiful book. Happy birthday Jan. Happy Birthday!! Hope you have a fantastic day. Dearest Jan Brett, have a very happy birthday! Your books are a joy to share! You are my favorite author study! Happiest of birthdays to an amazingly talented woman who has brought so many smiles and wonderful moments into so many homes! Happy birthday Jan. Thank you for filling my first grade classroom with wonder and imagination as I read your books to my class. And as my first graders choose to read your books during free reading time! I love, love Jan Brett! Wishing her a wonderful, fantabulous birthday! I, too, am a December birthday but on the other end; the 30th. Keep doing what you do! Happy Birthday, Jan! I love all your books. Happy Birthday Jan. My preschoolers live your books. ???????????? Hope you have the happiest birthday! My 2nd graders always love your books. Happy Birthday, Thanks for helping my kids develop a joy for reading! Happiest of Birthdays and have a great year! Love all your books ???? and there stories within a story. Happy Birthday Jan. I had the opportunity to see your presentation on Thurs. Nov. 30, at the Upcountry History Museum in Greenville SC. It was wonderful and inspiring. Thank you and I wish you many more birthdays.. Happy Birthday, Jan! Your books have been some of my childhood favorites! My daughter Lillian is celebrating her first Christmas this year and I cannot wait to share your books with her! Happy Birthday Ms. Brett!! Thank you for continuing to write fabulous books for my classroom library! My students and I love your books. I cannot wait to read the next adventure!! Happy Birthday Jan! I hope your day was as spacial as you! Happy Birthday! I’m excited to read what new adventure you have written! Happy birthday, Jan! Thank you for sharing your wonderful talent! ???? Happy Birthday Jan! I hope you had a wonderful day:) I absolutely love your books and so do the kids in my Pre-K class! Happy birthday Jan! My best friend and I both have the same birthday as you. Happy birthday Jan. I love your books. Your illustrations are beautiful. Happy Birthday, Jan! It’s an honor to read your books. Happy Birthday!!! You have an amazing talent for writing; thank you for sharing! Happy Happy Birthday!! I hope you have the most amazing day! 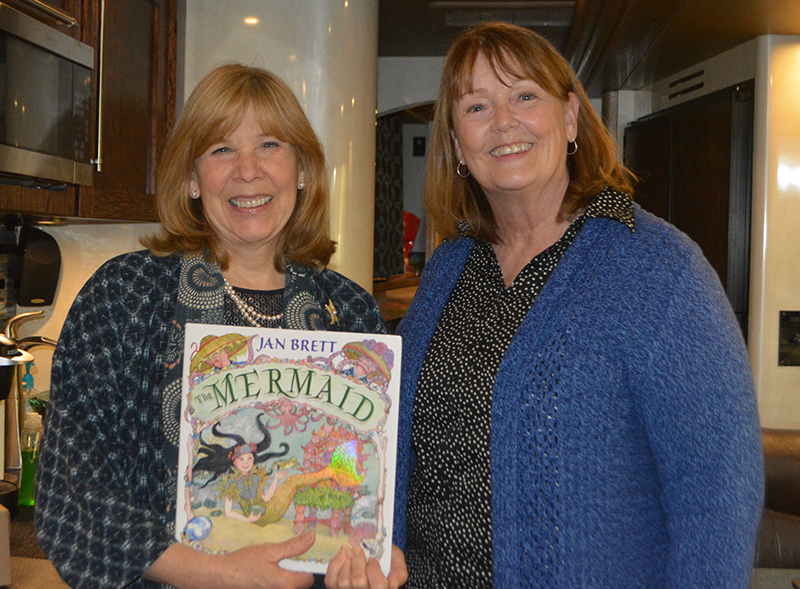 Happy birthday, Jan Brett! Thank you for creating beautiful books for me to share and teach with in my classroom and at home! Happy Birthday, Jan Brett. Thank you for all the joy you have brought to us. Happy birthday to a wonderful author! I have enjoyed reading your books to my own children and students for years. Thank you for your fun, imaginative stories! Happy Birthday Jan. I love your books and so do my grandchildren! Now I am sharing them with other young children that visit! Thank you for all of your books and messages you give our kids. Happy Belated Birthday Jan Brett! I love your books!! Happy Birthday Jan! We are doing an author study this week on you, and I am excited to go to school tomorrow and tell them it’s your birthday! Happy day to you! Love your books and illustrations…. Can’t wait to share with my teachers! Happy birthday, Jan! I sure do love your books! Happy Birthday! My daughter loves mermaids- she’s 5??? ?met you years ago at a tiny bookshop in Clinton NJ! Happiest of Birthdays Jan Brett. Love all of your books. Happy Birthday Jan! Thank you for bringing joy to so many children, families and teachers! ???? Happy Birthday Jan!!! ???? Happy Birthday Jan! You have been blessed with an awesome talent and a great understanding of kids. Happy Birthday, Jan!!! Thank you for all your amazing books! Happy Birthday Jan! My students just finished our gingerbread unit with The Gingerbread Baby! Happiest of birthdays Jan Brett! We finally have our Jan Brett Christmas tree in class for my final year of teaching. Happy Birthday to one of the best author/illustrator! I simply love all the books you have written. Happy Birthday!!!!!!??????????? ?I hope your year is full of joy, laughter, and love!! Thank you for our enjoyment of your wonderful books!!! Happy Birthday Jan! As a former kindergarten teacher, I have used and own many of your beautiful books! From a longtime fan! Merry Christmas! Happy birthday, Jan! Going to use “Who’s that Knocking on Christmas Eve?” next week with my 2nd graders. Love your work! Happy Birthday! Your books were my absolute favorite as a child, and I cannot wait to share them with my own students now as a new teacher. Happy Birthday Jan! I’m a longtime fan of yours. ???? Happy birthday! Thank you for sharing your gift of writing with children! We love your books!!! Happy Birthday Jan! Love your books , so do our preschoolers where I am director. Happy Birthday Jan! I hope that your day is perfect! My class and I LOVE your beautiful books! Happy Birthday, Jan! Thanks for your fabulous books I can share with my kindred! Sorry Jan….too many ??? ???????????? Happy Birthday!! My students LOVE learning about Jan Brett and experiencing her books! Happy Birthday to you (and me)! Mine was on 12/3. Love your books for my ESL classes! Keep them coming! Again, Happy Birthday! Have a Happy, Happy Birthday! Happy Birthday! Love your books!! Happy Birthday ma’am! I hope your birthday was beautiful and wonderful! Happy Birthday! We love your books! Your books bring joy to all ages! Happy Birthday Jan. Thanks for all the great books. It’s a beautiful day to celebrate an incredible author! Happy Birthday, Jan Brett! Your works hold a special place in the hearts of my students! ???????????????? Happiest of Birthdays Jan! My class and I are having so much fun with The Mitten and The Hat this week, can’t wait to share with the kids it’s your birthday too !!!! Happiest day of birth Jan! Happy Birthday Jan!!!! Have a Merry Christmas and a Happy New Year!!? ???? Happy ???? Birthday ??? ?to you.???? Love your books and beautiful illustrations. I love sharing the stories with my students who have special needs. The Illustrations hold their attention and they love to verbalize what they see. Happy Birthday, Jan! Your books have been treasures of mine as a young girl and continue to be as I share them with my first grade students. I always look forward to new books by you to add to my collection. Blessings! Happy birthday, Jan! Hope your day is full of wonderful things. Happy birthday, Jan Brett! Love your books! Our class especially likes reenacting the mitten as we read along. We get a large blanket and they all pretend that it’s a mitten and snuggle in, one at a time, underneath. Thank you for all your wonderful work! Happy Birthday, Jan!! My 4th graders are enjoying a few of your books this month. We have a ’12 Books of Christmas’ book report for December. Happy birthday! Enjoy your special day! Blessings for many more. Happy Happy Birthday! Enjoy reading your books ! Happy Birthday, Jan. You’re books are a favorite in my classroom! Happy Birthday! Thanks for the magical books! Happy Birthday, Jan! You’re books are amazing! Happy, happy, happy birthday, to you! In my classroom, we used to sing a “Happy birthday Mix Up”. We have the words on individual cards and the birthday child mixes them up and we sing, for example…birthday happy you to ~ you to to birthday…….. Birthday happy Jan Brett!???? Happy Birthday! I love sharing your books with my kids! Happy Birthday, Jan! My students and I both love your books! Happy Birthday Jan! December babies are the best, my birthday was yesterday. Love using your books in the classroom, the illustrations are beautiful. Happy birthday hope it is everything you want it to be! Jan Brett, Happy Birthday! Your books have filled my childhood with many wonderful memories. One that comes to mind, my mother took us on a road trip to see you years ago. I don’t remember the year, or where it was. I do remember it was quite a trip. I read Fritz and the Beautiful Horses about a million times. I also ate so many chicken nuggets on the way there, that I didn’t eat chicken for years. Fritz is still my favorite! I can’t imagine how many people you have brought happiness to through your books. Thank you and best wishes. Happy Birthday from a fellow December birthday ????. Thanks for your amazing works. We are excited to get into this one too. Happy birthday to you! Thank you for writing such amazing books and being an inspiration to us all! My students just love your books! Happy Birthday Jan Brett! LOVE ❤️ your work! Didn’t mean to post my email. Can you delete previous post? Or remove my email and insert my name? Happy Birthday Jan! I look for your books at the library, my preschool class enjoys them so much! Happy Birthday, Jan!!! Also happy holidays!! Happy Birthday, Jan! You are such a celebrated author! Happy Birthday! Your books have brought great joy to many of our preschool kiddos. Happy birthday Jan! Thank you for creating such memorable books for me students and my own children to cherish for years and years! Thank you for the beautiful books I’ve loved sharing with children. Happy Birthday!